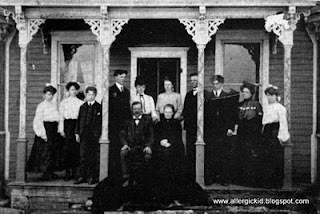 Swedish immigrants John Hendrickson Lake and Anna Erickson Lake with their 10 children, including 2 sets of twins, circa 1903/04 outside Hoffman, Minnesota. My great-grandmother, Amanda Elizabeth Lake is standing in front of the door on the right. The percentage of kids with food allergies has risen sharply and abruptly from almost none to one in every classroom in under a decade. Food allergies used to be extraordinarily rare, but they did exist, including in my family. My son is a fourth generation food allergy sufferer. The first member of my family that we can confirm had a food allergy was my Ama, Harriet Amanda Horton, who supposedly as a toddler was peeking out of the window at her mother, Amanda Lake Horton, when the picture above was taken. Harriet was violently allergic to shellfish her entire life. 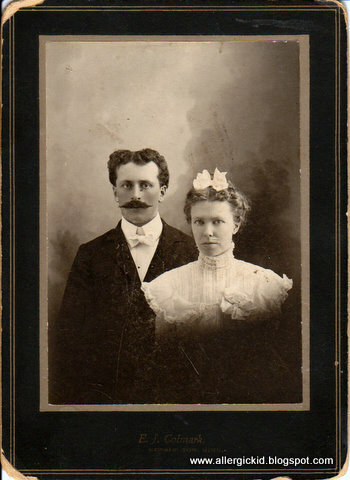 Harry Davenport Horton and Amanda Elizabeth Lake. I don't know if either of my Ama's parents had a food allergy. Her mother, Amanda died when Harriet was 14 months old. She was raised by her grandmother, and went on to marry and have four children, including my father, who was also extremely allergic to shellfish and less so to eggs. He eventually outgrew the egg allergy, but remained allergic to shellfish for his entire lifetime. 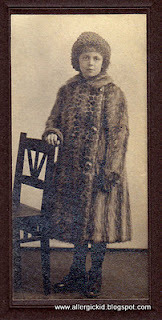 Harriet Amanda Horton, food allergy kid circa 1910/15. In my generation, my brother followed the same pattern as my father, outgrowing an egg allergy, but remaining so allergic to shellfish, that to this day he cannot walk into a seafood restaurant without having difficulty breathing. I do not have any known food allergies, but have clearly carried the legacy on to my son, who is allergic to seven different foods. Another generation of food allergies: my dad, lower left, and his older siblings. Growing up around food allergies profoundly shaped my response to my son's initial diagnosis. 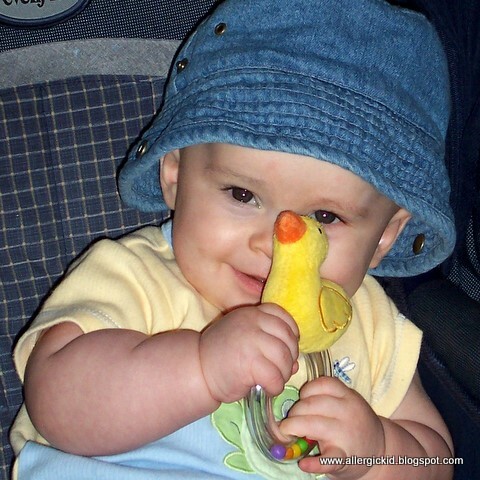 When my four month old, mostly breastfed preemie had his first allergic reaction to a milk based formula, we went to the emergency room to have him treated, picked up some Benadryl on the way home and simply carried on. Quite frankly he had other medical issues that were of greater concern to us at the time, and a food allergy we knew how to manage. That's the other part of my family's legacy, a stoic Scandinavian attitude that a food allergy is something that is managed by careful avoidance, rather than by medical intervention. It's just something that we live with. In three generations of food allergies, not one of my family members sought out an allergist. As my son approached a year in age and had more reactions as he was exposed to more foods, we simply treated them with Benadryl. If I suspected he was sensitive to a food, I'd dab some of it on his back to see if he reacted, then avoid it if he did. (I do not recommend doing this to test for food allergies, please see a medical professional!) I avoided giving him peanuts on his pediatrician's advice and stayed well away from shellfish, because of our family history. At three years of age, I allowed my son to eat peanut butter, since he had accidentally been given it once before without any kind of reaction. He got a few bites down before projectile vomiting and sprouting hives. I gave him Benadryl once again, then finally made an appointment to see an allergist. At the first appointment, the allergist grilled me fairly unmercifully about how I'd managed my son's food allergies. I had the impression that he either thought I was overreacting and my son didn't really have them, or that I had been extremely reckless in managing them the way I had. I was pretty sure he was leaning toward the latter by the end of the conversation, as I described the violent responses to various foods. Then the results of both the IgE and scratch testing confirmed every food allergy I'd reported. Shellfish, which I had never exposed him to, was highest on the scale, 4+ out of 5, closely followed by peanut. The doctor prescribed a 2 pack of Epi-Pens. After the visit I started researching food allergies online and discovered that they are not just my family's genetic quirk, but a new epidemic faced by an amazing community of families determined to overcome this unexpected threat to their children. As I read each report about new research and medical advances, I've almost allowed myself to begin to start thinking about a cure. Almost. My very own allergic kid. Please consider joining me and other members of my community at the Tampa FAAN Walk for Food Allergy on November 12. I'd be absolutely thrilled if you would consider joining my team, starting one of your own or making a donation. The Kid looks like his grandfather. Both awfully cute. I so related to your story. My son is a 3rd generation food allergy kid and he like your son has more allergies than past generations. Wow Libby, this is fascinating. Thanks for sharing this. I really hadn't thought about severe allergies going so far back. Love the pictures. Too much fun that you have these! My father was allergic to clams, my mom's sister is allergic to shrimp as is my brother. (He had trouble as a baby with milk so my mom put him on a soy formula...now as an adult he has stopped drinking milk as he finds it 'bothers' his stomach. I believe he still has yogurt and ice cream) I beleive I am allergic to walnuts. Never realized the funny feeling I had in my mouth was actually a reaction until my eldest son could vocalize and explain his reactions. My eldest son is allergic to dairy,eggs,beef,sesame,peanut/tree nuts,fish,shellfish,raspberry and mustard. My second son to peanut/tree nuts. (discovered this from trace amounts in a bakery cake in Grade 4). We still have our fingers crossed that they will outgrow them...a cure would be nice but I beleive there are still some kinks to work out. I live in Canada and just participated in the Walk to Axe Anaphylaxis. Started up by a 13 year old girl 3 years ago who wanted, for her 13th birthday, to raise money for allergy research...she raised 40,000 in the first year! 2nd year 75,000 and I am not sure about this year. Very inspirational...Sara Shannon (mother of Sabrina Shannon of which the law 'Sabrina's Law' is named after...protecting those children with anaphylaxis in schools) was there too. Good Luck at the walk! Sorry this was so long.